This unique piece of kit is one of our favourites as it forces teams to work together as a well-oiled machine, exposing any weaknesses in the process. 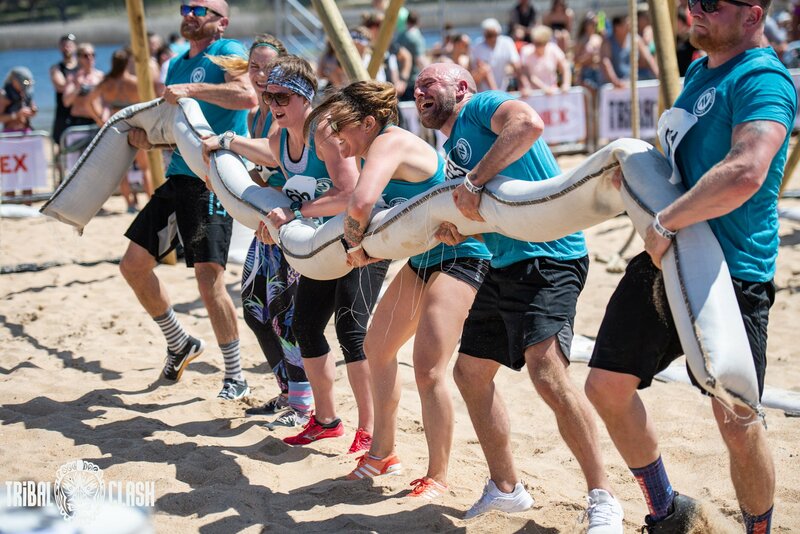 Previous sandworm workouts at our competitions in the UK and Portugal have included squats, cleans, thrusters and ground to overhead, with all six team members lifting and moving in unison. These might sound like simple movements, but throwing around a long and unpredictable object really is nothing like picking up a barbell. Get it wrong and it’ll feel like the longest workout of your life. Get it right, and you might just end up loving the sandworm as much as we do! Be prepared for it to hurt. In many ways. Our sandworms aren’t padded for your comfort; in the words of Andrew Barker: ‘why should we make it easy for the athletes?’ They don’t have neatly weighted sections, the sand inside doesn’t stay evenly distributed; they scrape your shoulders, they are awkward, and probably heavier than you think. Sandworms used in previous Tribal Clash events have weighed up to 240kg in total – this may not sound like a lot when split between six people but if you don’t work together it will feel like far more. So hang on in there and embrace the pain! Make a plan. Think about your positioning on the worm, decide who’s in charge, what the calls are (“3, 2, 1, LIFT” or just “LIFT”?!) and how you should split the reps. You may have to adapt on the fly if it all goes wrong, so prepare for this too. Work as a team. Timing is key when you are lifting the sandworm – work in perfect sync and it’ll seem easy, but if someone is even just slightly behind then it will feel twice as heavy. Listen to the rest of your teammates – if someone needs to take a break, pause for a few seconds; if someone can’t handle the weight, adjust your positions on the worm. The stronger athletes can take a longer section of the worm. Stay calm. The first time you lift the sandbag it will probably feel different to what you expected but don’t panic. Don’t rush, chip away at the reps and if it starts to go wrong, try not to get flustered. Sometimes you might need to take a minute to compose yourselves before starting again – better to do this than waste energy getting no rep. Listen to your judge. If you are out of sync or if just one person doesn’t squat low enough then that’s a no rep for your whole team. Your judge will let you know when this is the case and will be busy counting your reps so that you can concentrate on lifting and enjoying yourself! Fancy putting our tips into practice?! Then join us on the beach and the sandworm might become one of your favourite pieces of equipment!